The study reports on challenges related to the use of the language of attribution in academic essay writing by Post-Graduate Certificate in Education (PGCE) students at Rhodes University, as a microcosm of similar challenges faced by university students elsewhere. The study content-analysed 150 essays written by 50 PGCE students taking the course 'Language, Learning and Cognition' which the researcher taught. Key categories analysed were: student preferences for the type and style of incorporating authors' ideas in own academic essays, appropriateness of attributive words used, punctuation within the language of attribution, tense consistencies, appropriateness of attendant lexico-grammatical collocations, attributive words' fit with the syntax and grammar of the writer's ideas, as well as their consonance with the spirit and intent of the citations. Although findings point to gross challenges across all categories of analysis, they were most glaring in the matching of attributive words with the intent of citations and in the use of proper punctuation. Chief among the study's recommendations is the need for explicit instruction in, and attention to, the language of attribution in university students' essays by all lecturers and not just those in academic literacy development. Keywords: academic writing, attributive tags, attributive verbs, author's voice, citing, direct quotes, essay, essay quality, language of attribution, paraphrases, referencing, tense consistencies. In South Africa, as in most countries, there is an increasing dominance of English as the global medium of academic "writing and publishing which derives from English's unrivalled status as a global lingua franca. English is a revered language of academia, and writing in the language is given prominence. Curry and Hewings (2003:32) note that at university level, ". ..disciplinary knowledge and understanding are largely exhibited and valued through the medium of writing." This is particularly so in the Humanities where assessment is based, largely on essay writing. From the ideas of Plato and Aristotle through Rousseau, Saussure, Vygotsky, Bloomfield, and Pinker, Kern and Schultz (2005) observe a reversal in the speech-writing power relationship. In antiquity, speech was conceived as the primary medium of communication whereas writing was considered secondary and a representation of speech. Presently, in academia, writing is accorded a more prestigious status than speech. To the modern university student, writing merits greater scholarly attention than speech. Deviant language features in students' writing are regarded as emblematic of declining standards (Lillis & Scott, 2007). The importance of effective writing skills transcends higher education into the subsequent world of work. Chovanec (2012:8) aptly observes that, "In written academic discourse, linguistic, rhetorical and genre norms are not only expected, but are also actively enforced." Effective academic essay writing is, therefore, one of the hallmarks of good scholarship. This explains the prevalence of the use of essay -writing as a means to assess both students' progress and understanding of issues. According to Gray (2011:8), "there is a general consensus, even outside the academic community, that academic writing has distinct characteristics that set it apart from other types of language." Academic writing is governed by internationally recognized conventions which signify sound scholarship and allow for a global appreciation of the rigour of an academic piece of work. The celebration of diversity as fundamental to communicative practices would be problematic if it was extended to relativism of conventions governing academic writing. Because academic writing standards are universal, research on conventional aspects of academic writing, therefore, normally has a global application. The post-independence reorganization of the racially stratified South African university system allowing 'black' students into historically 'white' universities has led to a proliferation in student diversity in terms of their linguistic competence, among other variables. Such quantitative widening of university access is not unique to South Africa. That fact, coupled with the global nature of academic writing, speaks to the relevance of the present study for a wider readership outside South Africa. The onus is on higher education institutions to bring students of diverse competence levels to the acceptable standards of academic writing, which are largely fixed and of universal application, and not lower the standards to accommodate students' levels of proficiency. The essay answer can demonstrate robust erudition, not only by its content, but also by the manner of its presentation of that content. Flawed writing compromises the quality of the answer and impacts on the rating the student gets as feedback on their answer. A well-presented answer has an efficacious effect on the impression made on the reader, and if they are the assessor, it can well tip the scales in the student's favour. The appraisal of a well written answer is less exacting than that of a shoddy piece of work. Effective academic essay writing, therefore, has a reciprocal benefit on students and lecturers. Academic writing requires enlisting ideas of authorities in the field to bolster one's own. Incorporation of authors' ideas ordinarily requires an attributive tag to "...bridge the gap between the source details and the actual quotation" (Sibanda, 2010:39). Such attribution serves to give the spirit and intent of the author's voice and to ensure the author's input integrates smoothly with the essay writer's discussion. Attributive constructions should integrate smoothly within the text and not be an appendage to the essay. The researcher's prior university teaching experience with Bachelor of Education (B.Ed) and PGCE students has affirmed students' struggle with academic essay writing in general. This, despite the B.Ed students holding Diploma qualifications and the PGCE students holding undergraduate degrees. That personal experience is corroborated by Afful's (2009:32) observation, from his own experience as academic editor, that "...graduate students' research writing evinces several writing challenges. These are generally linguistic, rhetorical, and discoursal in nature." Among the persistent and pervading challenges the researcher has noted among university students' writing, is the lack of proficiency in the use of the language of attribution. Notwithstanding its pervading nature, there is a dearth of studies and literature on the challenge. The language of attribution straddles the lexical, grammatical, syntactic, and discourse dimensions of students' writing and yet it is, at best, glossed over in research. The present study contributes to this body of knowledge through the documentation of the nature and extent of challenges related to the use of the language of attribution in academic essay writing by PGCE students, the impact of the challenges on the quality of the students' answers, as well as the possible causes. The study's focus is made more explicit in the objectives which guide it. To identify, categorise, quantify and exemplify the (mis)-use of the language of attribution in PGCE students' essays (the selected language corpus). To infer the source or cause of errors from the nature of the error. To discuss the effects of the errors related to the language of attribution on the communication of meaning. The first objective is diagnostic; seeking to document the students' proficiency level, and the last two are prognostic; potentially informing university lecturers' instruction on the basis of students' current challenges. The objectives are not mutually exclusive and, as such, are discussed simultaneously rather than sequentially. A clear conceptualisation of the concept attribution is requisite to an appreciation of the categories of analysis employed in the study. The language of attribution relates to words an essay writer uses to transfer responsibility of a preceding or subsequent idea to a third party, the author of the text embodying the idea (Murphy, 2005). It distinguishes the essay writer's words from the source author's voice. ('Writer' is, henceforth, used to refer to the student as essay writer and 'author', to the writer of the source material being cited in the essay). The signalling of attribution is normally in a single introductory statement in the form of the author's name and/or a reference to their work; and an assertion (usually a verb) designating how the citation relates to the text. The language of attribution thrives on the use of reporting verbs. The language of attribution announces to the reader, the coming of another voice to complement or extend the writer's own voice. It sets the stage for a citation and prepares the reader for what is coming. Words assigned the role of heralding a voice external to the essay writer's can represent or misrepresent the spirit and intent of the additional voice. To say that an author 'argues' when what they are actually doing is 'report,' is a gross misrepresentation. Such disjuncture confuses the reader and compromises the quality of the writing. Proper use of such words demonstrates sound management of author, writer and textual interaction and the writer's sound understanding of quoted material. The choice of an attributive verb justifies the inclusion of the citation. It enhances the descriptive quality of the citation and can (mis)represent the author's tone and stance. Varying the type and placement of attributive verbs enhances the coherent flow of the presentation and avoids the monotony from overreliance on particular verbs like 'says', placed on particular positions. Appropriate use of the language ofattribution ensures authors' ideas are smoothly integrated into the writer's text to avoid a feel of a "dropped" or "floating" quotation. Subjective interpretative reporting: The writer does not merely report the author's idea or proposition, but interprets its spirit and intent. Words like believes, thinks and assumes, suggest the writer is privy to the author's mental state. Such wording foregrounds the author's state of thinking and backgrounds the actual content. The writer presents the author's ideas as their subjective view rather than fact. Nouns in this category include corollary, inference, explanation, finding, reflection. Recognition of evidence of the status quo reporting: In this category the writer refrains from providing additional or clarifying detail of judgement and allows the author's facts and evidence to speak for themselves. Attributive verbs for this category include show, demonstrate and suggest. Creation or reporting of an argument category: These are strong meta-argumentative words (Bondi, 2001) where the reporting suggests the presence of a counter-argument to the proposition cited. They create an atmosphere of potential debate. Examples include argue, assert, claim, and maintain. The knowing and reflection on beliefs category: These words are indicative of a coming to the knowledge or remembrance of something as represented by words like realises, accepts, acknowledges, admits, agrees, concurs. The attitudes, feelings and reactions category. This category is inclusive of markers of emotions, feelings or reactions like laments, bemoans, regrets. Such categorisation explains Salazar and Verdaguer's (2009) acknowledgement of the precision and versatility of reporting lexical items and the need for care in their choice and adequate control of their nuanced meanings.1 Perfect synonyms of attributive markers are rare, if any, and Hyland (1999:344) in Granger and Paquot (2009) advises the writer to ".clearly convey the kind of activity reported and to precisely distinguish an attitude to that information, signalling whether the claims are to be taken as accepted or not." Two attributive verbs may have the same meaning but differ in the degree or density of that meaning. The word 'notes' implies fact but is weaker than 'points out' which shares the same meaning. Some reporting words have very limited use in academic essays. Examples are 'declares' which is too ponderous for most citations and 'remarks' which is rather casual. avoidance of attributive tag and bracketing author's surname, year and page reference at the end, as in, "Attributive markers enable "...writers to modulate their ideas and position their work in relation to other members of the discipline" (Granger and Paquot, 2009:11). This study considers, among other things, the students' general preferences with regards to the incorporation of authorial voice into their own essays. The attributive words perform different functions.2 The need for precision in the choice of attribution words cannot be overemphasised. The use of the appropriate accompaniment for the attributive words is as important as the right choice of the reporting words. Some attributive verbs collocate with a preposition like to, for, with, and of, while others take on a noun or 'that'. Theoretical orientation and related studies Two models of academic writing inform the present study. The first is the study skills model which views students as deficient in atomized writing skills and requiring skilling in such (Zhang, 2011). Within the study skills model, focus is on generic trans-disciplinary aspects (Curry & Hewings, 2003). Attributive constructions represent such aspects in the case of the present study. The second model is the academic socialisation model which sees academic writing as acculturating students to mainstream academic discourses and conventions which are relatively stable. The university system is regarded as homogeneous and having a culture students should imbibe (Lea & Street, 2006). Implicit induction into academic writing skills and acquaintanceship with conventions is a requisite aspect of that culture. Both macro and micro-rhetorical conventions are requisite. The macro-conventions are what Afful (2009:23) calls ".the overall architectural structure of the text" and the micro-domain refers to the specific linguistic/rhetorical features which include the language of attribution. Literature on sources and types of errors is instructive to the identification of the nature and possible causes of language of attribution errors. James (1998) has three main categories of errors namely; interlingual, intralingual and induced errors. Interlingual errors emanate from imposition of the system of a first language (L1) on the second language (L2) when the two are not compatible leading to negative transfer. Intralingual errors occur within a language as in where a rule is over-generalized, incompletely applied and many other manifestations. Induced errors emanate from the failings of the material, exercises, pedagogical approaches or teacher talk that is used. Corder (1981) has covertly and overtly idiosyncratic errors as error categories. The former refers to the errors which conform to the grammatical ordering of words but which do not communicate the intended meaning. The latter refers to those errors which, despite being flawed in structure, communicate transparent meaning to the reader. There is a manifest dearth of documented research on university students' particular writing challenges both locally and internationally. McGhie (2007) attributes the academic writing under-preparedness of tertiary students to an ineffective South African public schooling system. This has necessitated the introduction of compulsory academic literacy courses under different names in different higher education institutions in South Africa. The home languages of the 50 students whose essays were analysed in the present study were: English-32, Isixhosa-7, Sotho-2, Shona-2, IsiZulu-1, Afrikaans-4, Swedish-2. All students confirmed having done an undergraduate course in academic writing titled differently in different universities. That problems with use of the language of attribution were manifest in a sample largely comprising English home language students, is indicative of the enormity of the challenge among university students. This necessitates an analysis of the nature and manifestation of the challenge in students' essays. Because the essays were produced for authentic course work assessment purposes, they were reflective of the best of the students' considered performance under normal assessment conditions. Content analysis, which was employed in the study, is a systematic and objective means of describing and quantifying phenomena through the analysis of written, verbal or visual communication messages (Elo & Kyngás, 2008). Its strength is its objectivity as it analyses existent data in an unobtrusive way. It also accommodates both qualitative and quantitative data, typically starting with qualitative data in the form of text which it then transforms into a coded, quantitative form. Hsieh and Shannon (2005) note content analysis' potential to uncover both manifest and latent content. Prasad (2008) identifies four important methodological considerations associated with the employment of content analysis in research, namely: identification of units of analysis, development of coding categories, sampling of appropriate content, and ascertaining reliability of coding. In this study, the language of attribution as reflected in attributive or reporting words, phrases and sentences, constituted the unit of analysis. Essays written by 50 students in response to three assignment instructions over the duration of a course taught by the researcher (thus, 150 essays in all) comprised the corpus of language for analysis. The essays which were not submitted in hard copy to the lecturer were photocopied in order to retain the primary data long after the essays had been returned to the students. Students' written essays were read through sentence by sentence with particular attention being paid to the instances where the incorporation of authors' voices by the writer was made. Every instance of the use of the language of attribution was recorded verbatim against each student code. The code was generated according to the students' alphabetical position on the class list. From the recorded instances of the use of the language of attribution, codes and categories were generated. Frequency counts were then made on each category and examples best representing each category noted. Analysis was then made of the data per category. A further sample of 18 essays, from the 150 described above, was analysed to determine the extent to which errors in the use of the language of attribution were consistent with the occurrence of errors more generally in each essay for English L1 speakers (referred to as NS for native speakers) and the English non-L1 speakers (referred to as NNS for non-native speakers). The analysis also determined the extent to which attributive language error manifestations corresponded with student general performance. Student performance was a measure of how adequately they had responded to the demands of the questions largely in terms of content. This additional 18 essay sample comprised 6 essays with the lowest score, 6 clustered immediately round the median score and the 6 highest scoring essays. In each of the three 6 essay categories, care was taken to ensure that the NS and NNS as well as the Foundation Phase (FP) or Grade R-3 and Intermediate Phase (IP) or Grade 4-6 for each of the three assignments were represented. 1. Extent of the use of authors' ideas and preferences for direct quotations or paraphrases. 2. Preferred style of incorporation of author's ideas. 3. Attributive verb agreeing in person and number with authors. 5. Consistence between words used to introduce a quote and the spirit and intent of the citation. 6. Proper punctuation with the use of attributive words. 7. The lexico-grammatical company each attributive verb keeps (Granger & Paquot, 2009). 8. Signal phrases fitting the syntax and grammar of author and writer's own words. The reliability of the categories is in their objective nature where different researchers using the same texts and categories would come up with similar results, a measure of the study's replicability. Access to the students' essays was guaranteed as the essay tasks were given and marked by the researcher who taught the course. The anonymity of the students was respected in the study. Data for the study were not of a sensitive type and there was no risk of disclosure of the identity of individuals. The data are also reported in aggregate form which renders identification of individuals impossible. Data are largely presented quantitatively in tabular form, based on the categories identified above, and is interpreted qualitatively. In the ensuing discussion, only salient verbatim quotes from students' work illustrative of the challenges within a category are used. The first category determined the extent of the incorporation of authors' ideas in students' essays. A count of citations per page for all the 150 essays was made. The pages excluded the cover page and the reference list as no citations are used in either. Because essays were page-numbered4 determination of the number of pages was eased considerably. Where text occupied half a page or more, it was considered a page and where it took less than half a page, it did not count as a page except if it could be combined by another half page text elsewhere. Table 1 indicates citations in relation to the pages, and gives percentages to the nearest whole number. Table 1 shows an average of 13 citations per page which I consider excessive enlisting of authors' voice by students within their essays. From the table, paraphrases outnumbered direct quotations in students' "writing in the ratio 59:41. There was also an overwhelming preference for integral in-text citation (where the author's name was part of the sentence elements) than non-integral citation (where the author's name or evidential material, year and page reference are placed in parenthesis). The syntactic positioning of the author in a citation determines whether it is integral or non-integral. Table 2 indicates the students' preferred style of incorporating authors' ideas in essays. The most preferred way of introducing citations was the prefacing of a citation with an introductory phrase as in De Wet (2002) identifies... .This style constituted almost half the citations. The least preferred was prefacing citation with the writer's own assertion followed by a colon. This was manifest in only 1% of the citations. There was also a marked avoidance of attributive tags by students in 28% of the citations. In the few essays where avoidance of attributive tags was less manifest, variety was induced in the incorporation of authors' ideas. In 28% of the citations, preponderance of the avoidance style was evidently an escape strategy from the demands that come with the use of attributive tags which later categories discuss. The incorporation of a citation within the writer's own assertion constituted 22% of the citations and related more to direct quotations than to paraphrases. The writer provided their own assertion and then incorporated the author's exact words usually prefacing or hedging the author's exact words using ellipses to show that some words are missing and only part of an utterance has been imported verbatim. In instances where the attributive verb was used, it had to agree in number with the author(s). Table 3 presents the subject-verb (dis)agreement as manifest in the essays. The number of citations excludes those where the essay -writer avoids using an attributive verb either by just bracketing the source details after the citation or using nouns to introduce a citation (4 406 instances) and those where the verb form is used in the past, which would agree with both single and multiple authors (2 144 instances). Single authored sources were cited more than multiple authored texts in the ratio 53:47. From single authored sources, only 16% of citations had no agreement between the singleness of the author and the verb used to attribute their idea, compared to the 25% from multiple authored sources. Two examples of errors from students' essays for single authored and multiple authored sources respectively are Pinnock, (2009) state... and Smits, Huisman and Kruijff (2008) says... . Most of the errors from multiple authored sources related to citations with the use of et al. as in Winch, et.al (2006) observes that.... There were also instances where a single author cites multiple authors like Kame'enui (1997), cited in Yopp et al (2002) say... or vice versa. Here, the student possibly determined the attributive verb on the basis of the number of authors in the source cited last rather than the actual source of the authorial voice. For some, it could be sheer ignorance of when to use the verb +'s' and when to use it without 's'. What is apparent, however, is that students have greater challenges in demonstrating agreement between attributive verbs and multiple authors than with single authors. That the greater percentage of citations had agreement in this regard is indicative of a significant number of students not having a challenge in this area. A greater challenge was manifest in the alignment of the attributive word with the spirit and intent of the citation as reflected in Table 4. The total of 10 986 citations excludes those citations for which no attributive words were used. A significant number of citations (70%) used attributive verbs and nouns to introduce citations. Although the attributive words which agreed with the spirit and intent of the citations were in the majority (59%), those not in sync with the purport of the citations were numerous enough to be a cause for concern. The challenge was even more marked considering that a sizeable number of citations agreeing with the spirit and intent of the citations utilised neutral reporting words like 'says' which agree with almost all citations. Examples of lack of tandem between attributive words and the citation are: 'Share et al (1984) states phonemic awareness in early grades to be a good indication of a reader's later ability'; 'Marzan (2007) laments that lack of...causes reading failure in future'; 'Armbruster, Lehr, & Osborn, 2001 claims that: Fluency is the ability to read a text accurately and quickly.' What we have in the examples above is not a stating of, a lamentation or a claim as the attributive word choices suggest. This imposes an attitude and intent not intended by the author which potentially misleads the reader. Such errors would be overtly idiosyncratic in that structurally the utterance is correct but it miscommunicates information. An equally challenging aspect was employing punctuation around the attribution of authors' ideas shown in Table 5. Citations with more than one punctuation error were categorised in the class of errors which the researcher deemed more serious in terms of communication. Properly punctuated citations constituted 51% of the total which is reflective of punctuation around the language of attribution being a challenge among the students. Absence of punctuation marks where they are needed and the use of punctuation marks on the wrong positions were most prevalent. Use of wrong punctuation marks was the least manifest within the category. The full stop was the most commonly misplaced punctuation in instances where parentheses are used at the end of a citation either to indicate the page reference or the source details. In such instances, the full stop was put just after the last letter of the citation instead of at the end of the bracketed information. An example would be "It is widely acknowledged that well developed literacy skills improve students' life chances." (Heckman, 2002, pg.1). These were local errors not impacting the global communication of meaning. Another punctuation challenge was the use of a mark where it was not warranted as in 'Hirsch (2003) suggests that, for learners to understand....' This stemmed from the overgene-ralisation where the assumption is that the comma should separate the writer from the author's ideas even in paraphrases. Other instances manifesting sheer ignorance included having two full stops on the short form et al. or having quoted material wedged between commas compromising the grammatically of a sentence. The comma was notoriously absent in errors of omission especially where 'however' was used as in ' Murray (2002) however recognises....' Instances where a punctuation mark was needed but a wrong one was used were evident in citations like 'The DoE (2008) identifies the five pillars of reading thus, phonemic awareness, phonics.' where the first comma should be a colon. Other challenges stemmed from ignorance of the use of a colon and a semi colon, use of single inverted commas and double inverted commas. Related to that was the use of a comma instead of semi colon to separate different authors within the same parenthesis as in (Benson, 2002, Dutcher, 2004). This made it difficult for the reader to separate the sources that were cited, particularly if they were many and multi-authored. In most cases, the phrase as follows was used to present a list of items but was not followed by a colon as it normally should. Punctuation represented one of the formidable challenges in the use of the language of attribution in academic essay writing. The words that accompany particular attributive words were also analysed and findings reflected in Table 6. In most citations (83%), attributive words were properly collocated. There was however, an overuse of the word 'that' to accompany attributive words even those which needed different company. Examples include assesses that, contradicts that, describes that, explores that, highlights that, supports that and so forth. This possibly emanated from a lack of understanding of the attributive verbs in question and the overgeneralisation of that to all attributive verbs. There was also the use of wrong prepositions or their use where none was required as in contradicts to, discusses about, disagrees to, advocates for, compares X and Y, objects on, believes on, among others. Some errors like 'discusses about' could fall within James' (1998) communication strategy-based or teacher-talk induced errors as they abound in teacher/lecturer talk and general communication. They could be symptomatic of students' fossilised language errors. Table 7 shows the extent of the match between the writer's attributive tag and the author's syntactic or grammatical construction. Although attributive words and phrases matched the authors' syntax and grammar in the majority of cases, the 30% citations where the fit was not manifest were cause for concern. In such citations, the introduction of the author's voice disoriented the grammaticality of the piece of writing instead of strengthening it. Examples of such misfits of citations include cases where the writer prefaced the citation with 'According to' and goes ahead to put an attributive verb after the year of publication as in According to Shapley (2002) says.... The writer in this case only has in mind the author's name as they write the attributive verb. For some it might be ignorance of rule restriction where the assumption is that after author details, there should be an attributive word bridging to introduce the author's voice. Other errors of a covert idiosyncratic nature in the category included: 'Herman and Anderson, as cited in Pressley (2000), the likelihood that a word...; As Neville (1974) noted that in government schools classes are much larger...; Prinsloo (2004) notes, "however, learners whose home language was not English or Afrikaans. ." These errors compromised the flow of the presentation to the extent that the reader's attention would be drawn to them rather than to the content being communicated. The issue of verb tense consistency as reflected in Table 8 was another challenge which had a similar effect. The maj ority of the essays (68%) consistently employed the same attributive verb tense in the attribution of authors' ideas and in most cases this was the simple present tense which gave a sense of timelessness of the authorial voice. Only 32% of all the essays analysed shifted from the simple present to the past tense in attributive constructions, in some cases, within the same paragraph where the shift was not warranted. The citations presented justify Afful's (2009) observation that "[S]ome Humanities and Social Sciences research students used quotations rather excessively, thus making their writing pretentious and showy. In such cases, the voice of the student is 'drowned' in a sea of other voices." In some student essays, it was one citation after the other with no follow up on the citations by the writer. That produced a 'copied and pasted' effect on the reader. The student hardly owned the piece of work on which their name was appended. Paraphrases were more prevalent than direct quotes possibly because they accorded the writer the flexibility to express authors' ideas in a manner which more closely supported their own. The flexibility, however, was open to abuse as evident in instances where the lecturer commented 'is this an accurate reflection of the author's ideas?' or similar comments. Paraphrases were also popular possibly because they did not demand the writer to alter and blend their idiosyncratic syntactic style to the author's. Writers could concisely provide their own expression of the author's ideas. The preponderance of integral citations compared to the non-integral citations possibly explains the prevalence of grammatically incorrect citations that characterise the writing of many students. Because in non-integral citations the language of attribution resides outside the sentence, it has no direct grammatical role in the sentence. By contrast, integral citations impact the grammaticality of the sentence in which they are embodied. Error absence in cases where students avoided the use of attributive language did not necessarily reflect student competence since problematic structures may be the ones avoided (Xie & Jiang, 2007). The prevalence of subject verb agreement errors in citations with et al. was possibly because the writer held in their mind the name of the first and only named author and so using a verb + 's' sounded appropriate. It is as if the writer is saying Winch (2006) observes that... The students may also have been so used to having attributive verbs in the form advises, argues, asserts questions, refutes, and so forth to the extent that such verb forms come to mind whenever they think of an attributive verb to use. In James' (1998) error types and causes, subject verb agreement errors where single authors cited multiple authors or vice versa could possibly emanate from overlooking co-occurrence restrictions. Such errors however, belong to the overtly idiosyncratic domain as they do not affect intelligibility of communication. Errors where attributive verbs did not agree with the spirit and intent of the citation were overtly idiosyncratic in that structurally, the utterance is correct but it miscommunicates information. Afful (2009) observes the narrow range of reporting verbs students rely on, and attributes that to students' inadequate knowledge of the semanticity of other attributive verbs. This compels them to overuse denotational reporting verbs like 'said' and 'mentioned', at the expense of what he calls "...evaluational speech act verbs such as 'argue', 'claim', and 'aver'" (Afful, 2009:30). Ignorance of the available range of attributive words and ignorance of the nuanced use of other words possibly explains student confinement to neutral verbs. Reservations to use a broad range of attributive words may stem from students having been repeatedly told their use of particular words was wrong which makes them prefer those they use without exciting correction on. Punctuation errors of addition represent an overgene-ralization and those of omission represent system oversimpli- fication in the case of omission errors. Some errors could be attributable to students not being conversant with the APA 5th edition conventions which was the departmental standard for citation. Although meaning was not affected in most punctuation errors, their presence made students' essays less reader friendly, being overtly idiosyncratic in nature. Correct punctuation goes a long way to aiding sense within a piece of writing (Gonye, Mareva, Dudu & Sibanda, 2012). Errors like ' Cooper and Hedges (1994) they say... ' which were manifest in students' writing evince general incompetence with the language. This is a common error among students whose first language is Zulu or Xhosa, and mirrors the use of the concord prefix in these languages. The creation of a sense of recency or immediacy through the simple present together with the sense of distance occasioned by the past tense had a confusing effect on the reader where tenses were mixed. This could be attributed to students' ignorance of the effect of the different tenses on the ideas they communicate as well as failure to distinguish timeless ideas from those that are not. In some instances, students were consistent in the attributive verb where a shift was needed. Such tense shifts did not recognize that the time frame for the actions or states described was the same. There was need to adopt a tense for the main discourse which would be the primary tense employed in the essay and where needed the student was supposed to make shifts into other tenses to indicate the time frame changes in the ideas communicated. An unwarranted mix of tenses or consistence with one tense where the ideas presented called for tense shifts gave a sense of discontinuity to research that was continuing or a sense of immediacy and timelessness to ideas or actions exclusively belonging to the past. 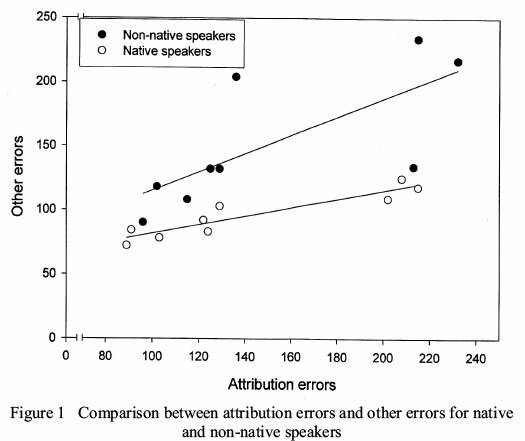 Figure 1 above indicates that as attribution errors increase, the other errors also increase for both native and non-native speakers of English. The steeper gradient in the corresponding rise of non-native speakers, viz. the native speakers is indicative of non-native speakers' greater propensity to the commission of both error groups than their native counterparts. Whereas the native speakers group was homogeneous in terms of their language, the non-native speakers belonged to diverse languages and had greater diversity in measures of exposure to, and experience with, the language than the native speakers. This possibly explains the greater degree of variance in their performance than their native speaker colleagues. Borg's (2000) study of an initial, non-assessed assignment written by 16 NS and NNS post-graduate students in education is instructive in relation to the present study's findings. His findings indicated that both NS and NNS speakers find conventions of incorporating source materials daunting. For non-native speakers, such problems were attributed to their language background which limited their proficiency in establishing textual voice. 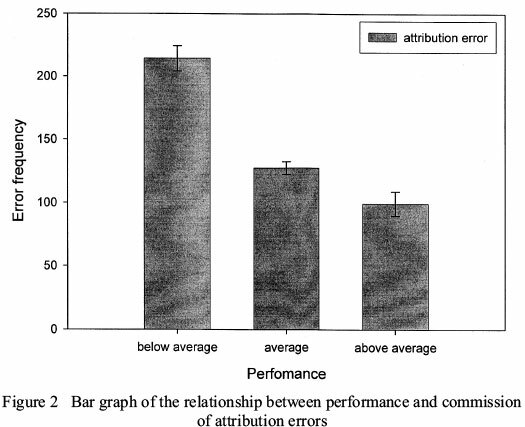 Figure 2 depicts the differences in the commission of attribution errors by students of varying levels of competence in the language. There is no overlap in the error bars of any of the three performance groups. There is also marginally less variance within the average performing group than the other two groups. Analysis of variance (ANOVA) results showed significant differences (F2,15 = 296.9, p < 0.0001) among the three performance categories. Tukey post hoc test showed that pairwise comparisons of all the three categories were significantly different (below average vs average, p = 0.00018; below average vs above average, p = 0.00018; average vs above average,p = 0.00027). The present study's findings point to university students' incompetence as far as the use of the language of attribution is concerned, with only six of the 150 essays analysed (4%) being free from errors related to any of the categories analysed. The fact that no two of the six error-free essays had been written by the same student meant that all the 50 students had made errors related to the use of attributive language in academic essay writing. Students' errors were most manifest in the use of punctuation marks in constructions of attribution. The challenge was in the use of inappropriate marks, insertion of marks where none were needed, as well as in the omission of marks where they were needed. Students' limited facility with the skill of punctu- ation was also apparent in the lack of consistence even in the errors they made which betrayed, not some confidence in the wrong things, but ignorance of the correct forms. Because of that, punctuation marks were placed in an ad hoc manner. There seemed to be an underestimation of the power of punctuation in the communication of meaning as an edit of punctuation would have resulted in consistence in its use in similar syntactic forms. The study also reveals students' ignorance of the nuanced meanings attributive verbs carried as well as a lack of appreciation of the power of the attributive verbs to (mis)represent both the author's ideas and the writer's interpretation of them. The general weakness was in the choice of the wrong verb for the purpose and the over-reliance on the neutral verbs. The use of the neutral forms coupled with the avoidance of the attributive verbs therefore, masked more potential errors related to the appropriate use of the verbs of attribution. Although subject-verb agreement errors were not as many as the other two errors, their manifestation compromised the academic writing of the students in a significant way. The challenge was most apparent where the subject was complex and not adjacent to the verb. Related to the subject-verb agreement errors were the errors related to tense shifts. These were employed in a manner which brought confusion to the presentation. There were either tense shifts in the verbs of attribution were these were not warranted or there was consistency in attributive verb tenses where the material forming part of the answer had time frames that necessitated movement between tenses. That the use of attributive words be taught explicitly by all lecturers at all levels and not just be relegated to the academic development or communication skills lecturer. The academic writing challenges cannot just be wished away. Lecturers need to be knowledgeable about the generic demands of academic writing if they are to confidently teach these to their students. That lecturers encourage diversity in the use of attributive words to avoid an overreliance on a few attributive words as well as to avoid too much avoidance of attributive language. That students be sensitised on the nuanced meanings of the attributive words. They can also be encouraged to read good academic texts from which they can 'pick-up' the discourse of academic writing. That students be encouraged to seriously consider peer review of their academic writing. That the proficient use of the language of attribution contributes to the quality of academic writing cannot be overemphasised. Inappropriate use of the language of attribution compromises the quality of an otherwise good piece of writing. The subject merits explicit attention and further research by teacher educators if they are to influence their students to produce academic pieces of work which can be enjoyed rather than endured. 1 An illustration of the precision in the use of some specific attributive lexical items is instructive for the reiteration of the need for proper selection of the terms. Admits indicates resistant acceptance, asserts presents an idea as an opinion rather than a fact, insinuates is indicative of the source author indirectly suggesting a negative evaluation, believes reduces an idea to the author's personal judgement and not a statement of fact, asserts suggests the author is putting forward an opinion they hold strongly, verifies needs to be accompanied with verifiable information, confesses implies an acceptance of responsibility or admission of guilt on the author's part, warns should accompany authors' ideas pointing to real danger. defends, maintains, rejects, supports, challenges, doubts, puts forward, refutes); some indicate the author's thoughts (assumes, considers, recognizes, believes, hypothesizes, thinks); and yet others indicate proof of something (confirms, proves, validates, establishes, substantiates, verifies); Some are emotionally neutral (illustrates, indicates, mentions, addresses, states, suggests, cites, writes); whereas others are emotionally laden (exclaims, insinuates, retorts). 3 Tenses are not merely indicative of time frame. The past tense distances the author's ideas as if they no longer apply whereas the present tense gives currency to such ideas allowing them a measure of generalizability. Because the past tense locks the author's ideas in the non-generality past, specificity of the study is imperative. 4 Although a few students failed to conform to instructions, the expected typing format was 1½ spacing, 12 point Times New Roman or 10 point Arial or 11point Calibri (body).